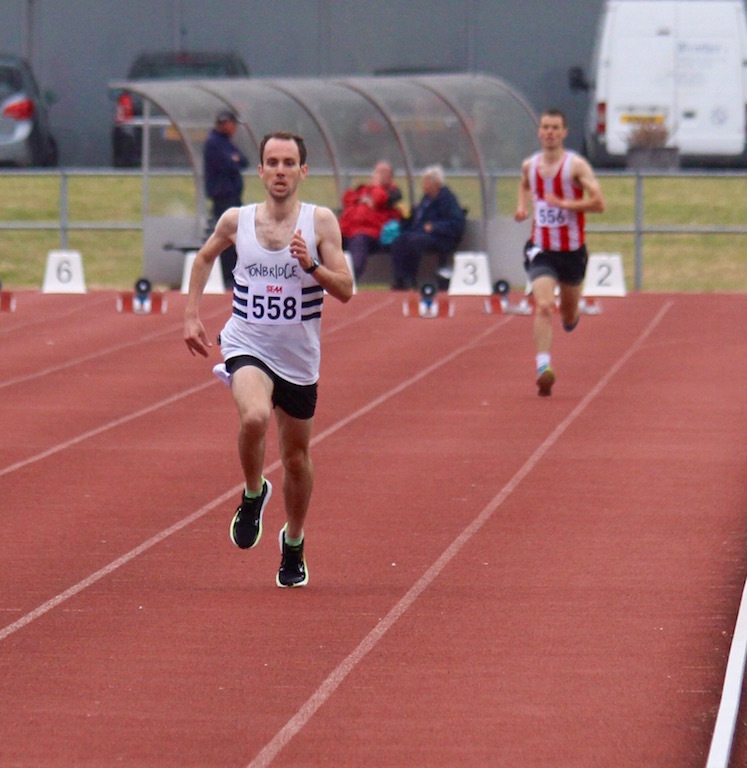 Simon Fraser ran 3000 metres in 9.44.8, at Ashford on Monday evening, in the South East veterans league. According to Power of 10 his only other 3k was the 10.21.4 a few weeks back, which makes it a 36.6s pb ! John Sanders has kindly supplied the full results from last Wednesday's National Prep Schools Championships, at Birmingham, which are on the Results 2015 page. It looks as though there were wins over 800 metres for Rebekah O'Brien, Ben Errington and Fin Croll. Tonight (Tuesday), Dominic Brown has run 1500 metres in 3.48.29 to move up one place to fourth on the current Tonbridge AC rankings. 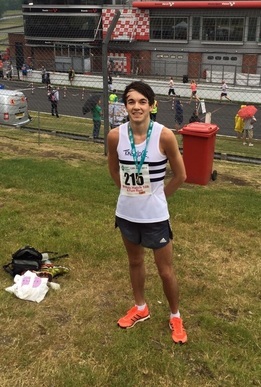 Dom finished second in the British Milers Club A race at Trafford, near Manchester, to take 1.7 seconds from his personal best. Dom's race can be watched at www.runjumpthrow.com . He was in the mens A race. Tonbridge finished fourth of the six clubs in the match, but still retain an overall second place and a chance of promotion. 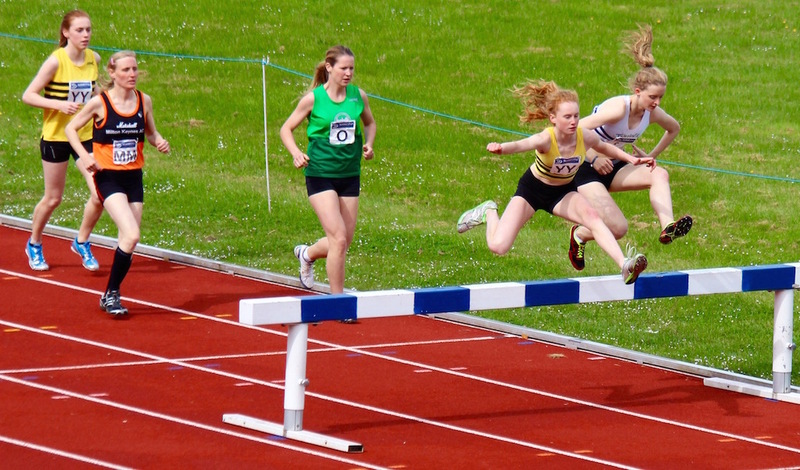 The highlight, from a distance running point of view, was Alice Ralph breaking the club under 17 women's 1500 metres steeplechase record with 5.21.45. Alice won the race having earlier raced to a 1500 metres win, also in a pb of 4.51.95. There were a mass of other personal bests and wins by the distance runners and I have shown these, plus the winners in the photo slideshow below. Full results and a sumamry are on the Results 2015 page. It was a beautiful day at the rural location of Lullingstone Park Run. There were 8 TAC members enticed by the prospect of higher points on offer. The organisers really appreciated the presence of our runners. It was great to have the support of Alan and Di. Dan Bradley was first home and just missed JT’s course record by 4 seconds. JT was late to arrive but still managed to finish third ! Steve Keywood was easily the best of the more mature runners (5th Overall) on a course that clearly suited him. This result has pushed him into 3rd place in the overall GP standings, 1 point behind Cain, but having only registered two scores so far. But a further one point ahead is JT, after registering 3 scores so far. Those that were there will be glad to hear that my 82 year old Dad appears to have made a full recovery after his fall that left him unconscious for 4 mins and very confused for an hour after, CT scans etc showed no internal damage. Next event is back at Tonbridge on the 11th July. 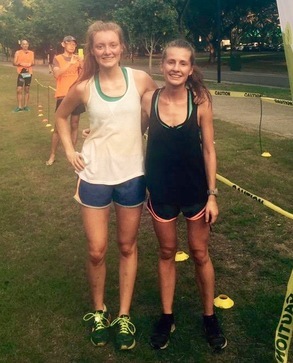 The first weekend result came in from Singapore, where Lucy Reid was first female (3rd overall) in the East Coast parkrun in Singapore. Lucy ran 19.09 and is currently on a tour of the Far East. The highlight of the evening was Kathleen Faes running 4.27.67 for a Tonbridge under 15 girls record, which was the 7th fastest ever in the UK in this age group. Kathleen's time broke Julie Adkin's (Goodge) record, which was set in 1986 and was not far short of Julie's under 17 record (4.26.4) and Kelly Holmes' under 20/senior record of 4.26.1. Kelly 'retired' from the sport in her late teens and then made a comeback a few years later, when she joined Ealing. 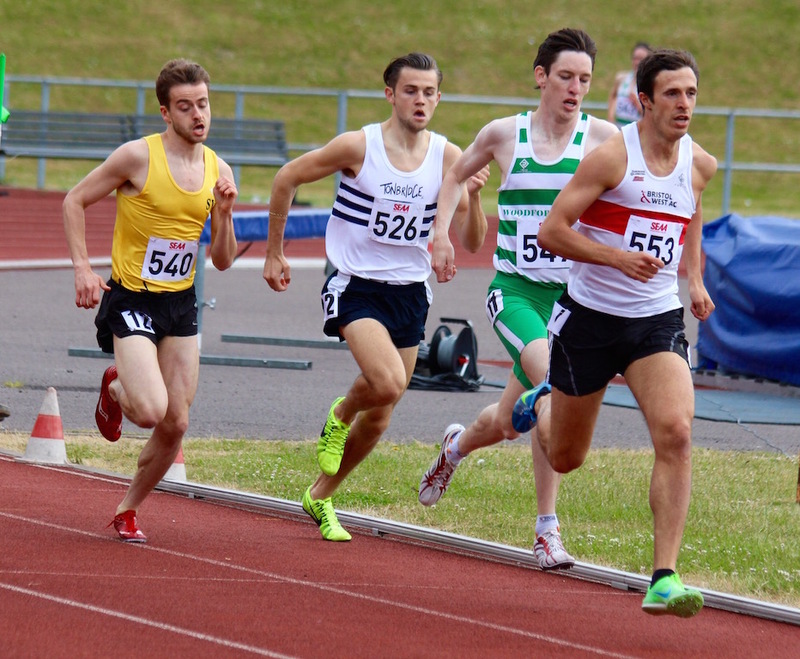 There were also personal bests for Michael Ellis (1500m 4.15.32) and Dan Watt (5000m i15.58.94). 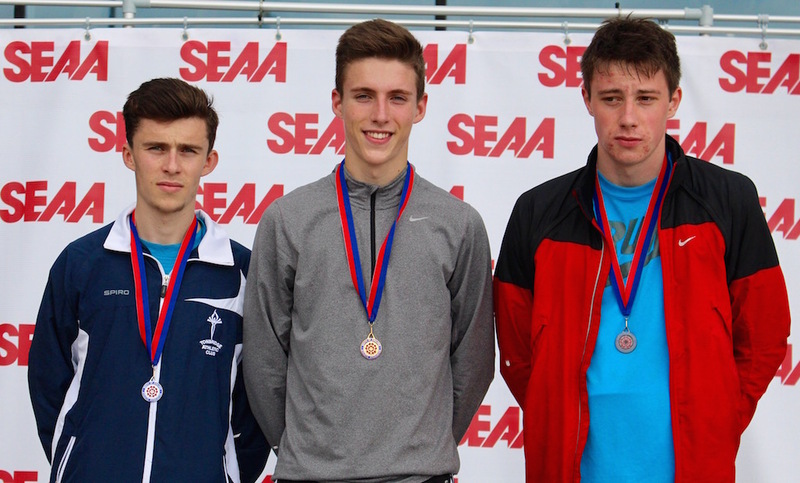 Tom Cox equalled his seasons best with 1.57.43 over 800m. 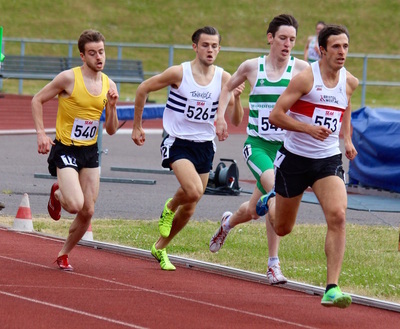 Sean Molloy (49.63) and Alex Hookway (53.79) both raced over 400m, before helping with the pace making for the BMC in the 800m and 1500m races. This week's circuit training, at judd School, has been cancelled as no coach is available to oversee the session. Hopefully we will be back to normal next week. TAC finished fifth in the match and are now fourth of the six clubs in the league table (the bottom two get relegated). There were plenty of personal bests and fine runs from the middle distance runners. On day 2 of the championships TAC had four competitors in finals action. Dom Brown was in the under 23 mens 1500 metres final, where he had qualified as 'only' a fastest loser on Saturday. However, in the final he surpassed all expectations to finish fourth in what was a very tactical race, held in windy conditions. 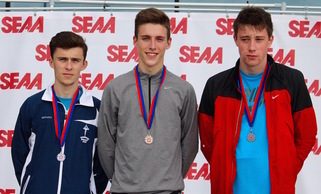 The other three were all in the under 20 mens 1500m final, but having performed so well on Saturday were disappointed with their Sunday races. James West couldn't quite keep in touch with the leaders on the final lap and placed 5th, whilst Miles Weatherseed and George Duggan were 11th and 12th, respectively. Chris Olley will have to wait to see whether he is selected for the European under 20 championships. He is the third ranked of three athletes who have the qualifying time. Ryan Driscoll has the massive task of trying to run a 13 second pb to get the 8.45 European under 23 qualifying time, that would guarantee him GB selection. His only chance is this coming Saturday at Watford. The Tonbridge team was severely weakened, due to a fixture clash with several other events. This meant that the team finished third of the four clubs at Brighton. We had a handful of TAC distance runners in action at Erith, but a series of strong performances came from them. Kathleen Faes won the Junior Girls 1500m in 4.32.01, to miss Julie Adkin's (Goodge) club age record by a hundredth of a second ! Also in the Junior Girls age group Evie Butler's 2.19.40 for 800m caught the eye, as it took 4.3 seconds from her recent pb. 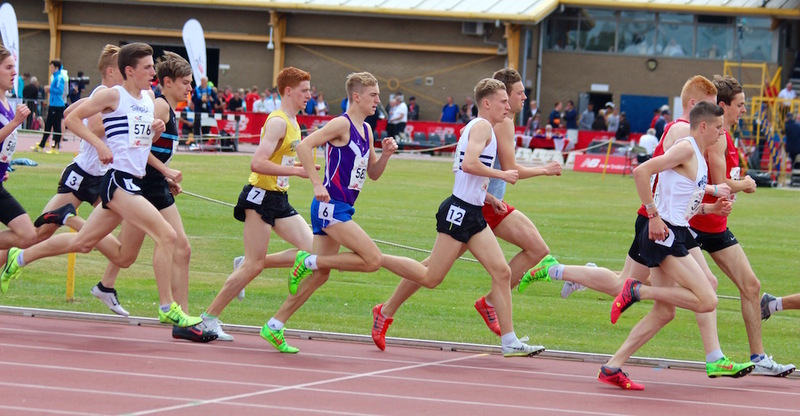 There was a TAC 1-2 in the Inter Boys 3000m from Alasdair Kinloch (8.43.50) and Jamie Goodge (8.47.92) as both ran inside the English Schools national standard. Eva Kolivoskova-Martin had another excellent performance when finishing 13th female in this extremely tough marathon. Eva ran 4.10.12. Tonbridge - Simon Fraser and Nicole Taylor both ran 18.00 to be equal first home. Ellen Crombie's (u15) 19.06 also deserves a shout ! Race videos loaded, including all the BMC Gold Standard races ! 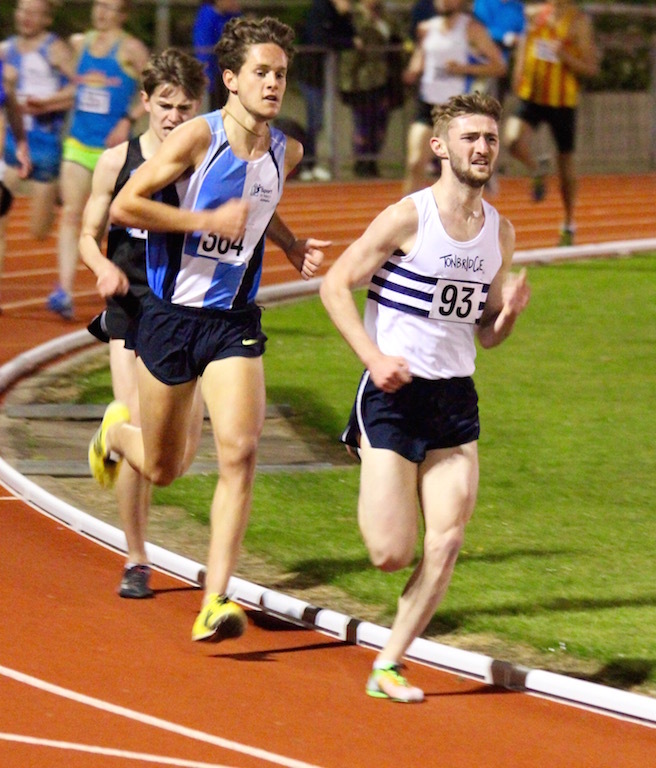 'Watford Wednesday' once again provided a good opportunity for personal bests, with 24 x 800 metre open races, plus some British Milers Club Gold Standard competition. Isaac Harding (u17) was making his debut at a Watford Wednesday and produced a 2.10.98 personal best, to take almost seven seconds from his official previous pb (he has run 2.11 in a school race). Isaac went through the bell in around 67 seconds and ran a very strong second half to win his race convincingly. 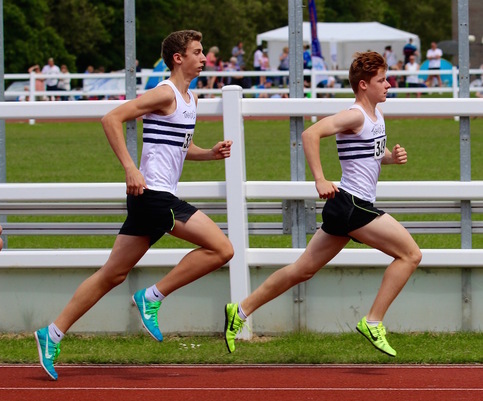 There were also personal bests for Sam Avis (u17) in 2.07.20 and Sam Crick (u17) in 2.01.97. Donald Carter, who has recently transferred from Invicta to Tonbridge, ran his first race in a TAC vest. Donald finished fifth in the BMC mens B race in 3.53.48, which was his first outing over the distance this season. His personal best stands at 3.52.60, whilst he recently ran 8.24.34 for 3000m. 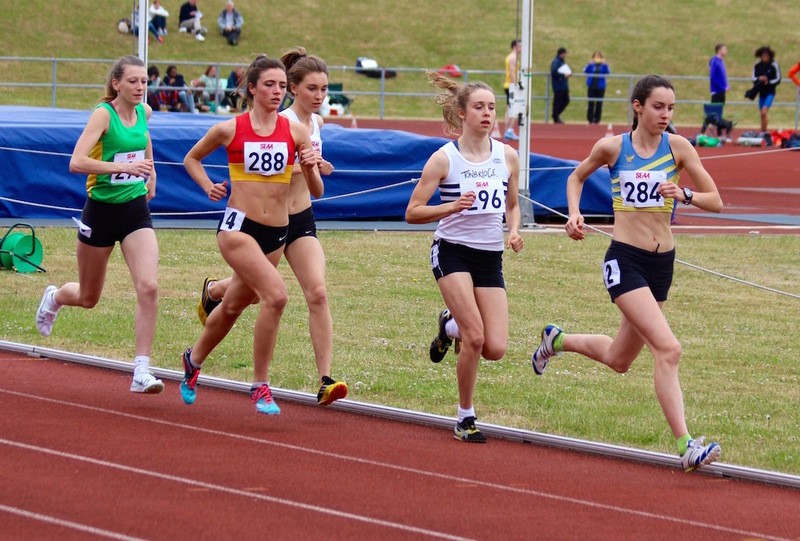 Phoebe Barker finished second in the under 17 women's Kent 3000 metres championship, at Dartford on Wednesday evening. Phoebe ran 10.10.9, to take 5.6 seconds from her personal best. The race was won by Holly Page of Dartford, with Jess Keane of Blackheath in third. Phoebe's time was just 0.9 seconds away from the English Schools National Standard, but well inside the entry standard, so she will be hoping it catches the Kent Schools selectors eyes. The previous day Phoebe had lowered her 1500m pb to 4.42.1 at the English Schools Cup, at Crawley. Photos courtesy of Richard Owen. There were just two TAC distance runners competing on day 2 of the championships and both were left disappointed with their runs. Alice Wood was 5th in the under 20 women's 1500m, which sounds positive, although there were only five starters, whilst Luca Russo was around 7th in the senior men's 1500m final. Both went to the indoor track, straight after their races, to complete a small training session, to get the races out of their systems ! I am sure that both will bounce back. Full results of the championships are on the Results 2015 page. Kent Young Athletes League at Bromley - Full results are now on the Results 2015 page. Results should appear here - http://www.nice-work.org.uk/events.php?id=42 Photos below of Staplehurst 10k, courtesy of Sasha Houghton. 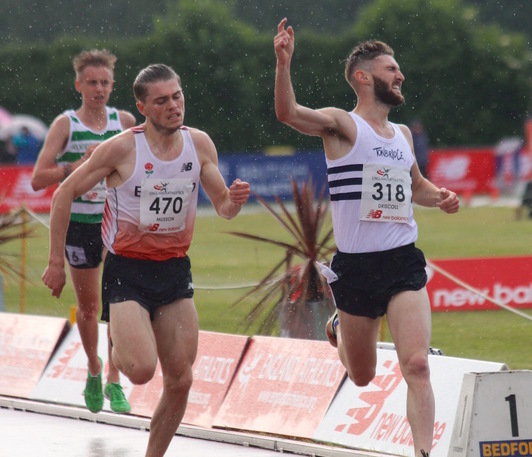 TAC had two championship winners on day 1 of the event as Ben Cole took the senior men's 5000m title and Miles Weatherseed won the under 20 mens 1500 metres. Corey De'Ath also had a superb run to grab second place behind Miles. As a bonus Miles has been invited to compete for the England team at the Welsh International Games, at the end of July, earning his first international vest. Luca Russo missed qualifying for the 800m semi finals by just 0.05s, but showed his character and took advantage of having also entered the 1500m and ran the heats of that event later. He looked far more in control, over the longer distance, to qualify for Sunday's final. Some race videos loaded ! 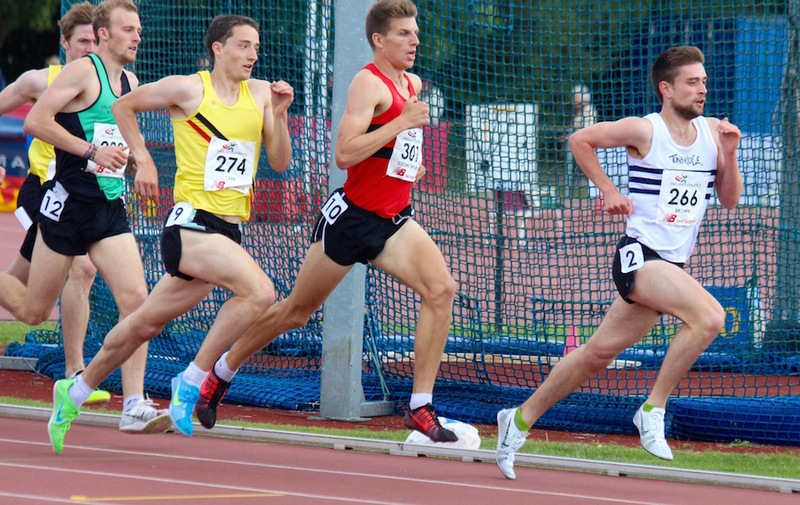 Tonbridge - TAC took the first three places through Dan Bradley (16.45), James Taylor (16.57) and Michael Ellis (17.38), with Lucy Kingston first female in a pb of 21.30. There were a couple of very encouraging runs tonight from two TAC distance runners. 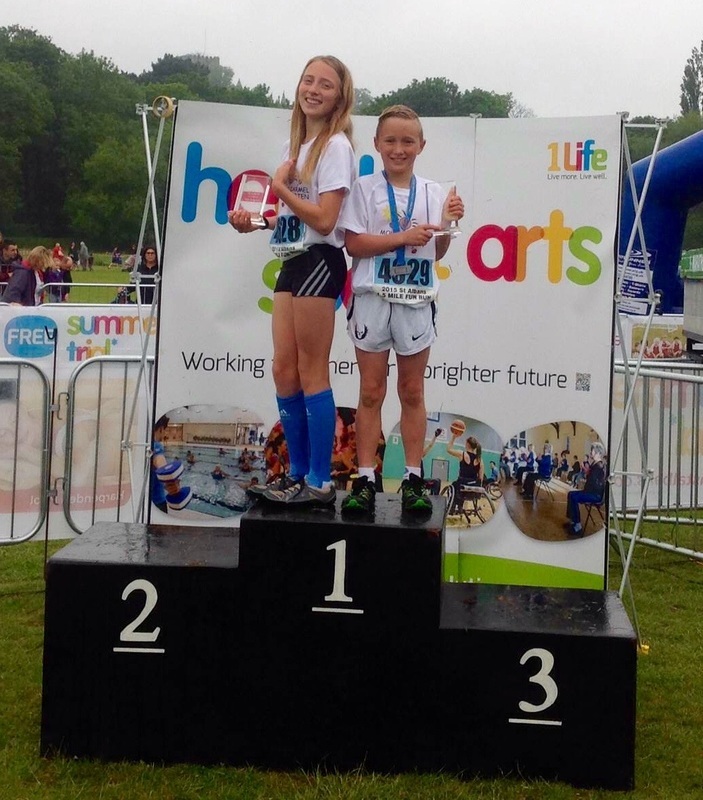 Jordan Saul won the Brands Hatch 10k road race, which was held on the motor racing circuit. It was the biggest win of Jordan's running career as he estimated around 600 took part. His approximate time was 36.52. 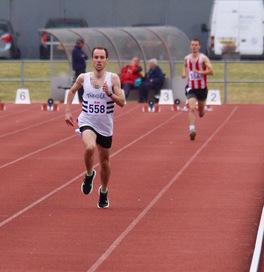 Also on Friday night Simon Fraser recorded his fastest 1500m time for eight years, with a 4.27 effort and winning at the Southern Counties Veterans League. Simon is still a year short of becoming a 'proper' vet at 40 years old. Earlier in the day the Kent Independent Schools Championships were held, at Ashford. Full results are on the Results 2015 page. 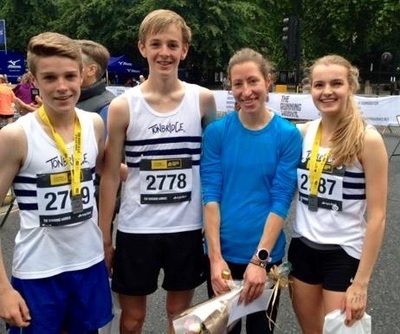 A number of local schools have qualified for the Regional round of the English Schools Cup and a few TAC distance runners competed at Ashford. Toby Ross (u13), who has continued to improve in the local parkrun, reduced his 1500m pb by 8.3s to 5.10.1. Tom Dean (800m in 2.07.1) and James Puxty (1500m in 4.22.4), both won their Inter boys events. Georgiana Crawley (u15) ran 2.44.3 for 800m and Ellen Combie 5.18.2 for 1500m. I have attached the latest GP table following Saturday's bumper turn out at Tonbridge, Sam Crick taking the first place and 25 points on age grading. There was a good mixture of young and more mature TAC members at the top of the table. Sophie Slack (JW10) leading from James 'JT' Taylor (SM 20-24) with Cain Bradley (SM 55-59) in 3rd place after 3 races. Medway and Maidstone Open Meeting, at Gillingham - Jamie Goodge won the 1500m in a pb of 4.06.26 and Stuart Brown had his best race of the season so far in second with 4.14.79. Worthing 10k road race - Eva Kolivoskova-Martin ran 44.03, which was just over a minute outside her recent pb at London. Flanders Cup, Huizingen, Belgium - James West ran 3.47.77 for 1500m to finish 7th in Belgium, just outside his recent pb. It was a relatively quiet 'Watford Wednesday' this week, perhaps due to being close to exam period for some and soon after a busy weekend of racing for others. Thankfully though the strong winds of Tuesday had died down and conditions were the best that they could be. Tonbridge had just three runners in action and all went in the fastest of the three 3000 metre races. Chris Olley won the race in 8.19.31, improving his pb by a fraction of a second, whilst Corey De'Ath was not quite at the same level as some of his recent races, recording 8.37.75. However, this was a season's best and less than two seconds away from his pb. Tim Faes ran a superbly judged race to come through strongly towards the end and slash more than a minute from his four year old pb, with 8.42.46. I have used Tim before as an example to others, who have had tough spells with their running. For more than a couple of years, with growth spurts and the like, Tim struggled with frustrating knee issues and related niggles. However, he came out of this spell with some fine cross country and road relay performances, which he has carried onto the track. Despite the windy conditions there was a good turnout for the open meeting. Fraser Gordon (u13) produced the biggest TAC personal best with an 800m in 2.31.44 to improve his best to 2.31.44. 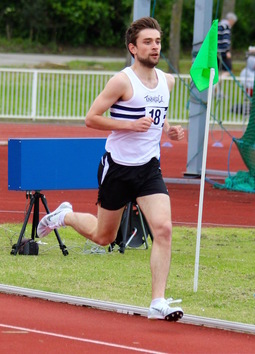 Alasdair Kinloch (2.02.74) was the fastest of the 800m runners, just holding off Christian Lee (2.03.07) at the finish. Ellen Crombie (u15) made an impressive 3000m debut running 11.17.22. Full track results and a summary are on the Results 2015 page.